At CES, the folks behind Pebble told the world that their Kickstarter funded e-paper smartwatch would begin shipping by January 23. 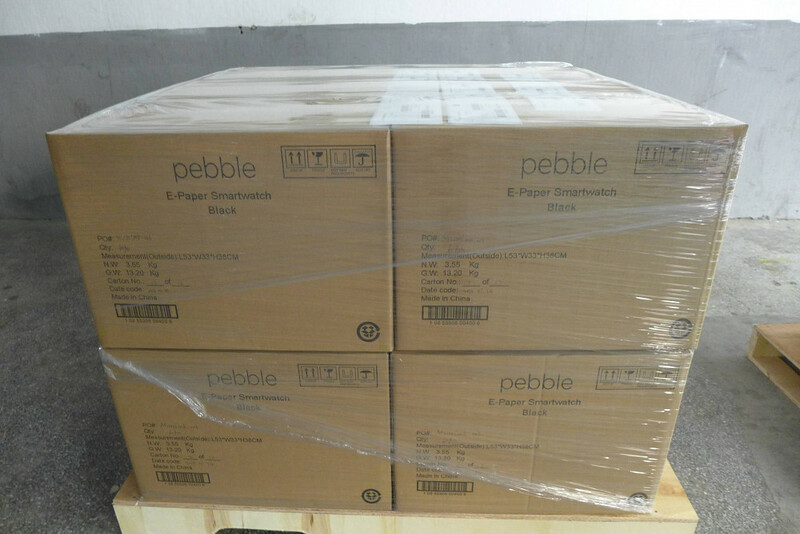 They stuck to that today, announcing to backers of the project that batches of the watch are on pallets and ready to go (see image above). Their email to backers also included a mention of “some kinks and issues” that still need to be worked out, but we’re assuming they are minor if Pebbles are shipping. On Thursday, January 24, the Android app will hit the Google Play store. So if you backed and receive one of the first Pebbles, you will have access to all of its power. iOS users on the other hand, they’ll have to wait until Apple gets around to approving the app, which was submitted two weeks ago. At this time, they are producing around 800-1,000 per day, but are working hard to get that up to max capacity – 2.4K per day. Today, they’ll ship just 500 Pebbles.